Is A Deadly Comet Out There Somewhere? Historians have speculated that large comets or asteroids colliding with Earth were responsible for ancient extinctions of life. There are major impact collision holes around the planet that help prove that such strikes have occurred. Thus there has been cause for people to speculate that such a catastrophic event may someday happen again. Indeed, a lot of people thought it was going to happen in 1997 when comet Hale-Bopp, the largest of its kind ever recorded to enter our solar system, whisked past us. Its nucleus was surrounded by a dust cloud estimated at over 2.5 million kilometers wide. Even though it passed us from 120 million miles away, it lit up the night sky for almost a year. The appearance of this comet and a photograph that some said suggested a UFO was following was believed to have led to the ritual suicide of the Heaven's Gate religious cult that year in California. A few months after Hale-Bopp appeared Comet Hyakutake, which wasn’t anywhere as large but it was among the comets that passed relatively close to Earth, at 10 million miles. 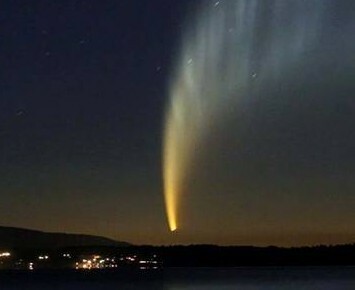 Because of this, it appeared about as bright in the sky as Hale-Bopp. My wife and I were living on the Navajo Reservation in Northeast Arizona when those comets flew over. There, under a clear desert sky, we had a ringside seat. We never believed these two spectacular light displays were any danger to us or our planet. Graham Hancock, a British writer who has published books and articles about such things as ancient civilizations, altered states, ancient myths and astronomical events, suggests in his book Magicians of the Gods, that there is a massive piece of debris hidden in the dust of the Taurid meteor stream that passes us twice a year that we may someday have to recon with. Hancock quotes his colleague, Dr. Bill Napier of Cardiff University Center for Astrobiology, as warning that “several large ‘dark’ fragments of the original giant comet still lurk, shrouded by dust, within the stream.” This stream, which is 30 million kilometers wide, passes us each year around June or July, and then again in October or November. The stream is about 30 million kilometers in width and it takes Earth 12 days to get through it each time it passes by. This has been going on for about 20,000 years and Earth has escaped a deadly encounter with those big fragments so far, so Hancock believes it is highly unlikely we will see such a catastrophic event happen in our lifetime. But the probability is always there. Hancock believes parts of this comet, known as 2P Encke, broke into multiple large fragments and caused an “extinction level event” on Earth about 12,000 years ago. He points to ancient destroyed traces of an advanced prehistoric civilization that appears to have been wiped out from human memory. Among the ruins from that period may be at Gobekli Tepe in Turkey. Comet 2P Encke was first discovered by French astronomer Pierre Mechain in 1786. So enjoy the night lights when the Taurid meteor stream passes us again this summer and remember that somewhere among all those particles burning through our outer atmosphere fly some very large objects that might also come calling.